Have you ever felt unable to navigate a legal problem and been bogged down by complicated legal jargon? Perhaps during an issue with your employer or regarding your student housing arrangements? Do you believe you know your rights? And if not, do you know where to access the information and find support to ensure you're protected? MORR (Make Our Rights Reality) is a national project run by an organisation called Youth Access. It aims to 'teach young people about their rights and give them a voice to challenge injustice.' MORR recently visited the Beatfreeks office to run a workshop, teaching young people about a range of issues including housing, employment and benefits. These are five key take aways for those who couldn't make it, we hope it can act as a foundation for those wanting to learn more about their rights. The first and perhaps most important take away from the MORR workshop was that, learning about your rights and educating yourself on the law and legal issues is fundamentally YOUR responsibility. You can be forgiven for not understanding the "legalese" and "jargon" included in legally binding documents but it is your responsibility to seek help and assistance. The information is all online for young people to find, it is just knowing where to find it and how to access it. Projects like MORR aim to help people do just this. At the workshop, young people were taught how to break down legal problems into sizeable chunks - legal problems can often be incredibly overwhelming and might involve things like landlords' repair responsibilities. Young people were told that it is important to be AWARE of the type of legal issue you find yourself involved with. The law can broadly be broken down into two categories - civil law and criminal law - however, each of these categories contains many other forms of law, civil law itself embodies employment, housing, benefits, consumer, education, health and many more. It's not hard to see how it gets confusing! Being aware of the type of legal issue involved will help you focus your planning, organise yourself and mean you can get appropriate help when you need it. Once you know the type of legal issue you need help with, it is incredibly important to be aware of the various sources of support available to you. There is a tonne of information out there and many support services, you just need to be prepared to find the ones most appropriate to you. 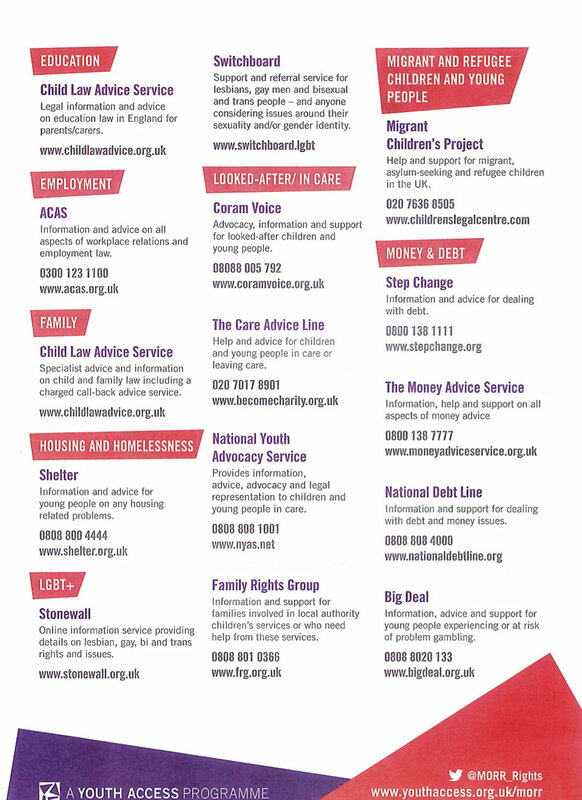 Organisations like SHELTER can explain complex housing law to young people and there are also less specialised services that can give you general advice and support like Citizens Advice and Advicenow. Get in contact with MORR and they will be more than happy to direct you to an organisation that can help you. Finally, it is important to have a clear plan and be prepared. Having a clear plan of action will help you to be confident and assertive when dealing with legal issues, don't allow yourself to feel powerless, be in control and know what your next steps will be. MORR have no problem saying that more needs to be done to communicate legal rights to young people and have consistently said that authorities need to do more. Visit the MORR website for more information on their campaign and how to get involved.